What an encouragement to cling onto that Ellie shares with us today that, "Jesus’ character, his power and his faithfulness are no different through thick and through thin." Human hearts long for consistency and security but we live in an age where things rarely stay the same for any length of time. Plans are altered at the drop of a text, relationship statuses change at the click of a mouse and our mood soars or swoops depending on whether we hit that coveted number of likes on Instagram or not. Deadlines hit and are met, only to be replaced by fresh ones and playing a constant game of catch up can quickly become a daily routine - I can think of few things in my life that are the same today as they were a year ago. But there is one. When you hear the name ‘Jesus,’ so many things spring to mind. From his string of names in the Bible, ‘Wonderful Counsellor, Mighty God, Everlasting Father, Prince of Peace’ (Isaiah 9:6) to the miracles he performed, the thousands he taught, the tears he wept, the prayers he prayed and the cross from which he hung, paying the price for our sins so that we wouldn’t have to. And yet, he began his earthly life in a stable. The defenceless sleeping newborn can’t have inspired much confidence that first Christmas 2000 years ago as Mary and Joseph gazed down at the tiny creature who would apparently ‘save the people from their sins’ (Matthew 1:21). And yet that helpless child was already, on the first day of his life, the Saviour the Jews had been waiting hundreds of years for. He and his promise to save remains unchanged from that first birthday, to the cataclysmic afternoon on which he was nailed to a cross, to the day we are all waiting for when he will come again in glory. When it feels like you are playing a game that never ends, do you turn to and put your trust in the one who doesn’t change; our loving Saviour? When deadlines crash in around you, old and new challenges rear up without warning and you reach Sunday night desperately hoping for a less turbulent week the temptation can be to pin your hopes on something right in front of you. This may be your studies, it may be another person, or it may simply be your own capability to get through each day. However, while these things are good gifts from God and can provide some comfort, they can and will eventually let you down. Hebrews 13:8 renders those temptations futile and holds out instead the only true constant there is in this world - Jesus Christ. Jesus’ character, his power and his faithfulness are no different through thick and through thin, and yet it’s so easy to fall into the trap of believing that he is the one who changes, rather than our fickle hearts. When we’re going through the mill, his promises are the same as when living wholeheartedly for him feels like a walk in the park, but wonderfully, however we may feel has no bearing on the facts of who Jesus is, why he came and what he achieved on the cross. Nearly two years ago, everything in my life turned upside down when my Dad died and I barely recognised myself anymore. I wrote something then about the reality of trying to live out Hebrews 13:8 when nothing else would make sense of the new life without my Dad that I found myself forced to live. Although I’ve gone back to some sense of ‘normal life’ now, the truths that I clung to with all my might then are still the ones I cling to just as tightly today. I’ve changed, and I’ll change again in years to come but Jesus Christ has not and will not. Why not pray that this Christmas you’d see the all the fun and festivities through the lens of an unchanging, steadfast Saviour who will still be there long after the last bauble is packed away for another year. 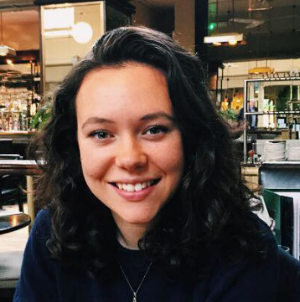 Ellie has recently moved to London to start a second degree at UCL and can’t wait to see what opportunities God has in store for her there to tell people about her great friend Jesus. A Cambridge girl at heart, she loves Chelsea buns, cycling everywhere and early morning runs to Granchester!